The What: Yamaha Unified Communications has released a new firmware version for the CS-700 Video Sound Collaboration System that improves the camera performance and adds access to image setting controls. The What Else: The version 1.1.1 update adds backlight compensation to provide more image brightness and reduce sharpness. It also unlocks control settings, allowing IT to adjust the image to fit the room's lighting environment. Increasing service response and efficiency, IT staff can update all units simultaneously and control image quality via the system's integrated network management system. "We developed the CS-700 to simplify the meeting experience, and after listening to our customers, we further strengthened the performance and options of our HD camera to make it even easier to achieve high-quality video," said Mike Fitch, vice president, global sales and marketing, Yamaha UC. "This is the first of many updates we have planned as part of our commitment to ensuring the CS-700 delivers best-in-class collaboration capabilities." 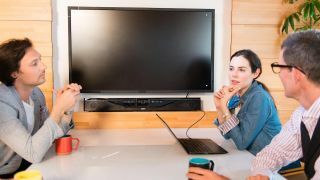 The Bottom Line: The CS-700 from Yamaha UC is designed to provide huddle spaces with best-in-class audio, video, and screen-sharing capabilities in an all-in-one videoconferencing system. The latest update aims to enhance this experience and provide technology managers with increased control over the system.